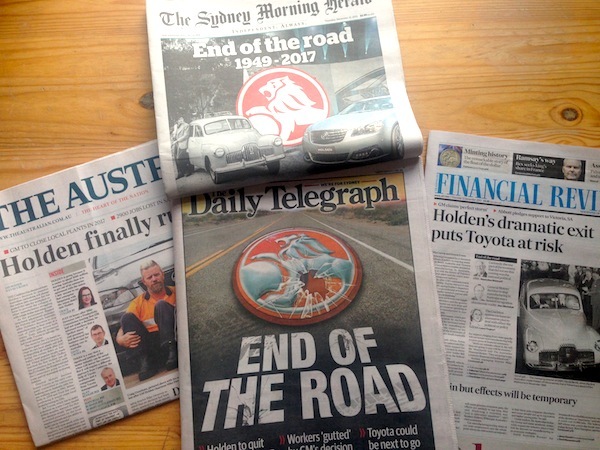 Now that we all have had time to digest the news that Holden will close its Australian operations in 2017, it’s time to review how the local press has taken the event. My striking observation is that a majority of publications actually agree with the decision, illustrating the pragmatism that characterises Australian society today. 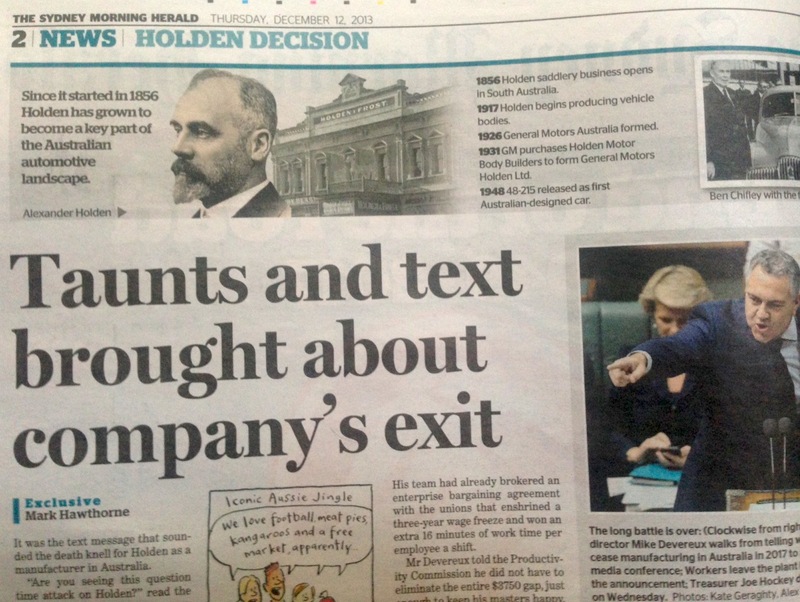 The Australian’s Dennis Shanahan declares “the politics of the closure of Holden’s plants (is) an empty sham full of mock surprise and pointless blame-shifting. Holden’s demise has been expected for years and no amount of taxpayer-funded bailouts was going to keep Holden open.” The Sydney Morning Herald‘s Elizabeth Knight goes even further: “Good riddance to the great Australian con – that we need a local car manufacturing industry. We, as Australians, really need to move on. We need to recognise that we carry no natural economic advantage (in the car manufacturing industry). The fact Australia has persevered as long as it has is one of the more staggering elements in this vexed and emotionally charged debate.” Even if I tend to agree, these opinions are delivered in a particularly harsh way and it is fascinating that such views dominate the scene. 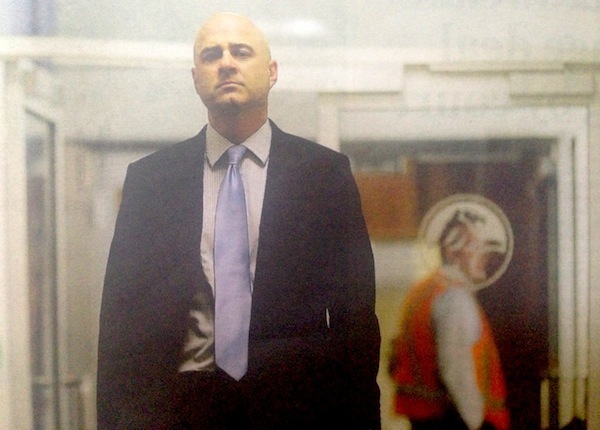 Mike Devereux walks from his announcement on December 11. The Daily Telegraph points out the “manufacturing malaise” in Australia, listing all carmakers to abandon the country recently: Nissan in 1992, Mitsubishi in 2008, Ford in 2016 and Holden in 2017, with Toyota’s long-term future “uncertain”. The same newspaper also lists the main milestones of Holden’s “iconic history” in the country, including the fact that one in two cars on the road in Australia back in 1958 was a Holden – to be compared with 5% of all new cars sold today being a locally made Holden… The one millionth Holden was sold in 1962, five millionth in 1990 and seven millionth in 2008. In 1978, the year the Commodore nameplate was launched, Holden celebrated 25 years of continuous sales leadership. In 1991 Toyota beat both Holden and Ford to rank #1 brand for the first time, but Holden would have a go until 2002, the last year it ever ranked first. Full article featuring Holden sales forecast below. Australia July 2012: Subaru BRZ sold out in 3 hours!